Do export taxes offset import tariffs? The intensity of export restrictions on the trade of metals and minerals is increasing, affecting the cost of products, introducing supply-chain uncertainties, and leading to trade disputes. Rarely do they achieve the purpose for which they were put in place. Import restrictions, by contrast, are more transparent, predictable, and subject to stronger disciplines. But highly restrictive measures, whether imposed by importers or exporters, represent a real impediment to trade in affected products. The author is an Economist and Trade Policy Analyst in the Trade and Agriculture Directorate of the OECD. The views expressed in this paper are those of the author and do not necessarily reflect the views of the OECD or its Members. The author is grateful for research assistance provided by Roberto Maeso Benito and Martin Michelini. No country is self-sufficient in every raw material. Some metals and minerals are found in only a few countries, therefore the strong concentration of production means that restrictions on trade in such materials are particularly disruptive to global supply chains. Taxes on the trade of raw materials increases the costs of products that will most likely be traded many times before they are ready for final consumption. Any increase in the cost of products early in the supply chain is magnified every time the raw material is traded or transformed. An export or import tax on copper ore, for instance, will increase the total implied rate of protection of the processed copper concentrate and copper cathode, which in turn will increase the cost of copper sheets and wires, which will be translated into higher prices for computer chips, telecoms equipment, heating and cooling systems and even guitar strings. Export restrictions have contributed to instances of shortages of supply and strong swings in prices in products other than metals and minerals. This was the case, for instance, during episodes of high food and agriculture prices in 2007-08 and 2010-11. In 2008, the cereal price index reached a peak 2.8 times higher than that of 2000.1 Here, rising prices were exacerbated by trade restrictions, in particular on the exports of staple foods. Export restrictions on raw materials not only impact the cost of products but also introduce uncertainty of access to supply for producers of semi-processed and final-consumption goods. These restrictions have created trade frictions and led to trade disputes including cases that have been brought to dispute settlement at the World Trade Organization (WTO). The existing international trade regulatory framework is very different for import tariffs compared with export taxes. Import tariffs have fallen during successive rounds of multilateral trade negotiations since the ‘Kennedy Round’ in 1963. WTO members have bound their import tariffs, whereby they pledge not to raise them above a maximum, and have lowered tariff bindings during subsequent multilateral and plurilateral negotiations. In addition, each WTO member has concluded preferential trade agreements with, on average, 14 other countries2 and all such agreements include provisions for preferential market access and lower import tariffs. The use of export restrictions on metals and minerals is increasingly common. The inventory of export restrictions on industrial raw materials records such restrictions on 65 strategic and essential raw materials in all major exporting countries.7 Over the six year period for which information has been collected between 2009-14, the stock of export restricting measures—outright export bans, export quotas, export taxes, non-automatic export licensing requirements and other export restricting measures—has risen significantly (Figure 1). Moreover, once export restricting measures are in place, they are rarely lifted. Over a six year period, export restrictive policies increased by 7.2 per cent, or 153 occurrences, per year on average. Turnover is also limited as restrictions tend to remain in place once they are instituted, illustrated by the prevalence of measures ‘left unchanged’ in Figure 2. Not only are export restricting measures increasing in number, they are also becoming more restrictive. The new measures introduced over the period 2009-14, for example, are overwhelmingly of the more restrictive type: export prohibitions account for more than half of the stock of new measures followed by fiscal taxes (Figure 3). DS 394, 395 and 398: China - Measures related to the exportation of various raw materials where the EU, Mexico and the US challenged Chinese export restrictions on nine categories of industrial raw materials— bauxite, coke, fluorspar, magnesium, manganese, silicon metal, silicon carbide, yellow phosphorus and zinc. DS 431, 432 and 433: China - Measures related to the exportation of rare earths, tungsten and molybdenum. DS 508: China - Export duties on certain raw materials. China, for instance, maintains export quotas on 12 of the 55 products for which data has been collected by the OECD and export taxes on 21 of those materials.11 Dispute settlement cases that have been brought before the WTO recently regarding restrictions on exports have been almost exclusively on these products. Figure 3. Source: OECD Inventory of Export Restrictions on Industrial Raw Materials [see footnote 5 for link]. Note: 'Other export restricting measures’ includes such policies as domestic market obligations, minimum export prices, fiscal taxes, VAT tax rebate reductions and withdrawals, restrictions on customs clearance for exports, qualified exporters lists and captive mining. These measures are very different in terms of their implementation and their impact on exporters, consumers and world markets. Export taxes on metals and minerals are generally high while some are prohibitively high. In some cases, the level of the export tax is so high that it undoubtedly reduces competitiveness and is most probably impacting the amount of trade taking place. The average export tax on raw materials, for example, was 9.44 per cent and 7.45 per cent on semi-processed goods.14 Export taxes were placed on 8 per cent of global exports of metals and minerals and 5 per cent of semi-processed goods resulting from them (Figure 5). Export taxes can be as high as 50 per cent on raw materials and up to 40 per cent on the semi-processed products that result from them. Such prohibitively high tax rates will negatively affect the exports of the countries that impose them and this has a wider-ranging impact on total trade volumes then is generally estimated, as little trade is taking place when such high export taxes are enforced. However, export taxes differ substantially by product and sub-sector. 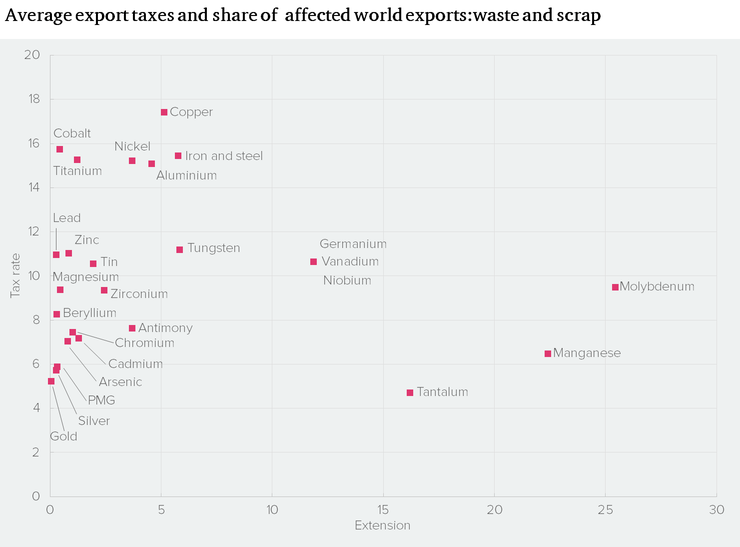 For example, ferrous metals, metal ores and minerals, and metallic waste and scrap are all subject to high average export taxes and high maximum rates (Figure 6). Figure 6. Source: OECD Inventory of Export Restrictions on Industrial Raw Materials [see footnote 5 for link]. Note: Average of all non-zero export taxes imposed in 2012-14 by major global producers and exporters. Coverage is outlined in the methodological note of the Inventory of Export Restrictions on Industrial Raw Materials, http://www.oecd.org/tad/benefitlib/inventory-export-restrictions-ind.pdf. Trade restrictions on metallic waste and scrap pose a particular challenge to the aim of decoupling industrial production from resource use, which has been deemed necessary to achieve the Sustainable Development Goals.15 Metallic waste and scrap is generated either as a by-product of the production process of mining, from refining and producing industrial products or from recycled goods that provide recovered metals and non-metallic materials that re-enter the production cycle as inputs. This process is also referred to as the ‘circular economy’. Export restrictions on metallic waste and scrap mean that materials are not always recovered and re-used to the largest extent possible, in particular if countries restricting the trade in such materials do not have the recovery and recycling capacity or the demand for such materials. But the circular economy is already well underway: approximately 40 per cent of copper and 40 per cent of steel are produced from recycled materials. For other common materials such as aluminium, lead and zinc, over 30 per cent of production presently uses recovered inputs.16 However, export taxes remain high on all of these materials: average export taxes on waste and scrap emanating from all base metals are above 10 per cent and above 15 per cent for waste and scrap from copper, iron and steel, nickel and aluminium as well as cobalt and titanium (Figure 7). Figure 7. Source: OECD Inventory of Export Restrictions on Industrial Raw Materials [see footnote 5 for link]. Note: Average of all non-zero export taxes imposed in 2012-14 by major global producers and exporters. Coverage is outlined in the methodological note of the Inventory of Export Restrictions on Industrial Raw Materials, http://www.oecd.org/tad/benefitlib/inventory-export-restrictions-ind.pdf. Trade policies regarding imports are very different to the ones described for export taxes. Most-favoured nation (MFN) tariff levels are applied to all WTO member countries, and significant international engagement in negotiating import tariff reductions over the last 70 years has encouraged countries to bind their tariffs, by pledging not to raise them above an agreed maximum. This has resulted in substantially lower import tariff levels for minerals and metals in major importing countries. Examining major markets for metals and minerals—for example, OECD countries, China, the United States and the European Union—shows import tariffs are substantially lower on average compared with the export taxes imposed by producing countries. For instance, applied tariffs on raw materials in the US are 1.2 per cent on average, 0.6 per cent in the EU, 0.7 per cent for the OECD overall,17 and 3.1 per cent in China. Import tariffs on semi-processed products are slightly higher, showing some tariff escalation. 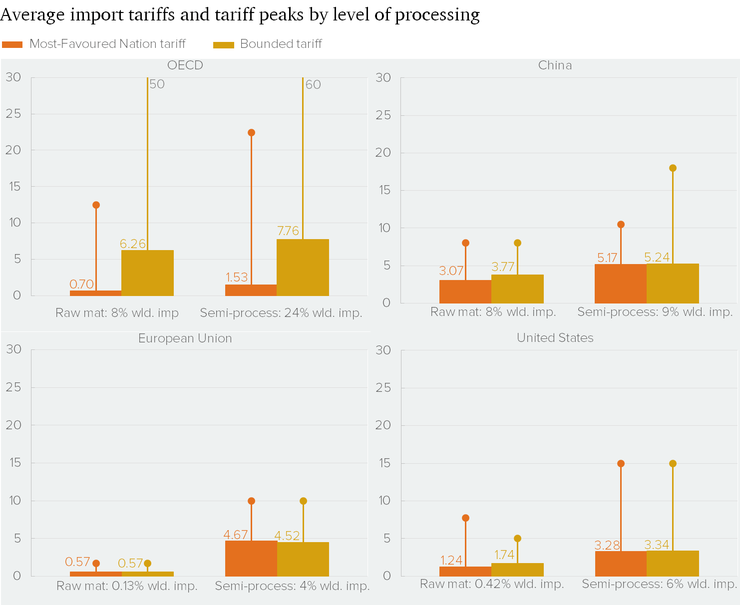 Tariff escalation occurs when import tariffs on goods that undergo more processing are higher, thereby creating a disincentive for raw materials producers to process their products in-country as they will face higher tariffs on the exports of goods that have undergone more processing in their main markets. 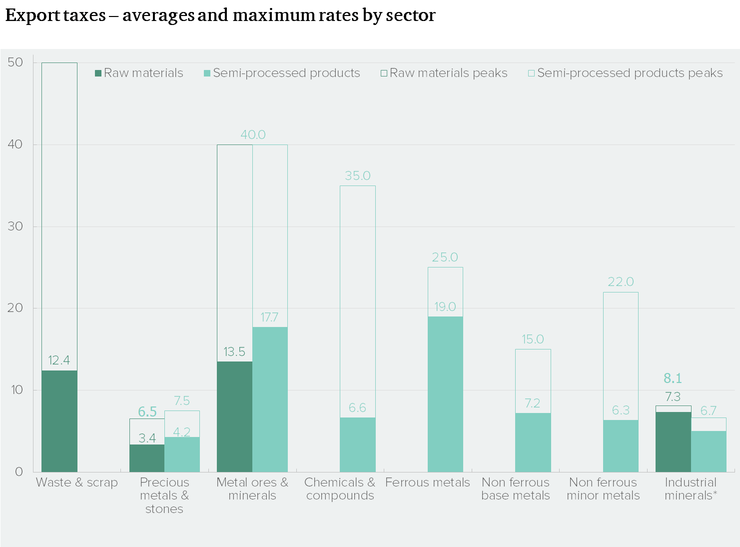 Some tariff peaks on raw materials and semi-processed minerals and metals are higher—up to 10 per cent in China and the EU on both raw materials and semi-processed goods, 15 per cent on semi-processed products in the US and 22 per cent in the OECD area (Figure 8). These import tariffs are substantial and undoubtedly create a strong disincentive to import. They remain, however, few compared with the maximum rates on export taxes. Figure 8. Source: OECD Inventory of Export Restrictions on Industrial Raw Materials [see footnote 5 for link]. Note: Most-Favoured Nation tariff (MFN) is the tariff applied to imports from WTO members. Bound tariff (BND) is the maximum level at which an MFN tariff may be levied according to WTO multilateral trade rules. The data presented here refer to tariffs on 83 different HS codes classified as raw materials and 385 as semi-processed products. Some users of export restrictions assert that export taxes applied on raw materials by producing countries offset import tariff escalation that exists in their major markets. Some producers of raw materials have suggested that import tariff escalation in their major markets confines them to exporting lower value added mineral ores as opposed to higher value added processed products. However, the preceding analysis suggests that this is not the case. As explained above, export taxes are on average significantly higher than corresponding import tariffs. Furthermore, peak export taxes are higher than peak import tariffs. Moreover, for the three major markets—the EU, US and China—applied tariffs are very close to bound rates. That means these economies cannot raise their import tariffs significantly without reneging on their WTO obligations. On the other hand, export taxes are not subject to any WTO disciplines and can be raised without consultation. In addition, for most products, export taxes are substantially higher than any import tariff escalation. 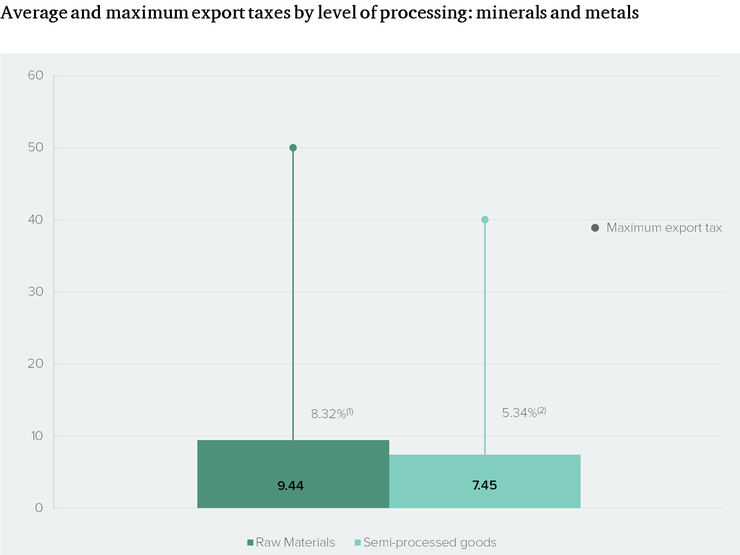 For a few products, however—gold, manganese, platinum metals and to a lesser extent silver and tantalum—export taxes are proportionate to the difference in import tariffs between the raw materials and semi-processed products in major markets (Figure 9). This is partly because the export taxes on these products are fairly low at around 5 per cent. Figure 9. Source: OECD Inventory of Export Restrictions on Industrial Raw Materials [see footnote 5 for link]. Note: Tariffs refer to average applied tariffs per product of non-zero values. Export restrictions have been used with increasing intensity on metals and minerals. Moreover, once export restricting measures are in place, they are seldom lifted. Some raw materials producers that use export restrictions do so to raise tax revenues or support a downstream processing industry; others have suggested that they do so in order to counteract the impact of tariff escalation by importing countries. Examining major markets for metals and minerals shows import tariffs that are substantially lower on average compared with the export taxes imputed by producing countries. Similarly, tariff peaks are higher on exports, but high taxes on both the import and export sides represent a real impediment to trade in these products. For the three major metals and minerals markets – the EU, US and China – applied tariffs are very close to bound rates. These countries cannot raise their import tariffs significantly without reneging on their WTO obligations. On the other hand, export taxes are not subject to any WTO disciplines and can be raised without prior consultation. Nonetheless, trade restrictions have the ability to decrease policy transparency, introduce greater price volatility – with all the negative impacts that brings – and can lead to retaliatory measures. 2.↑ Hofmann, C., Osnago, A. and Ruta, M. (2017) 'Horizontal Depth: A New Database on the content of Preferential Trade Agreements', Policy Research Working Paper, 7981, Washington D.C.: World Bank. 3.↑ For a summary of WTO disciplines on export restrictions and those agreed in preferential trade agreements, see Korinek, J. and Bartos, J. (2012) 'Multilateralising Regionalism: Disciplines on Export Restrictions in Regional Trade Agreements', OECD Trade Policy Papers, 139, Paris: OECD Publishing. 7.↑ Coverage is outlined in the methodological note of the Inventory of export restrictions on industrial raw materials. The product coverage extends to 57 minerals and metals, six wood products and metallic waste and scrap. 9.↑ USAID (2013) 'Economic Effects of Indonesia’s Mineral-Processing Requirements for Export', produced by Nathan Associates Inc.
12.↑ Fliess, B. Arriola, C. and Liapis, P. (2014) 'Recent developments in the use of export restrictions in raw materials trade' in OECD (2014), Export Restrictions in Raw Materials Trade: Facts, fallacies and better practices, Paris: OECD, p.43. 14.↑ This is the average of all non-zero export taxes placed on 65 minerals and metals by all major global producers. Data in this section comes from OECD (2018) Export restrictions on Industrial Raw Materials. Coverage is outlined in the methodological note of the Inventory of export restrictions on industrial raw materials. 19.↑ One of many articles outlining the recent changes in tariffs is Kowalski, P. (2018) 'Remaining Lucid at an Outbreak of a Global Trade War', showCASE, 80, Warsaw: Center for Social and Economic Research. 20.↑ ‘Nuisance tariffs’ are defined as tariffs that are so low that they cost more to implement than the revenue they generate. There is no agreed level below which tariff levels are considered nuisance tariffs but during the Doha round of negotiations, some proposals suggested that a level of 3 per cent was appropriate. In a submission to the Asia-Pacific Economic Cooperation (APEC) forum, Hong Kong suggested that nuisance tariffs were those of about 2-3 per cent. In Australia’s Customs Tariff Amendment Bill no. 3 of 2000, nuisance tariffs are defined as those 5 per cent and lower.